The St. John's Red Storm have made the NCAA Tournament for the first time with Head Coach Chris Mullin at the helm. The Red Storm won 21 games this season, the This season, the Red Storm has matched its highest win total since 1999-2000 by emerging victorious in 21 games. They started the campaign with 12 consecutive wins, entered Selection Sunday with five Quad One victories on its resume, including a neutral site triumph over VCU and three wins in four regular season attempts against Marquette and Villanova . St. John's NCAA Tournament journey will begin on Wednesday night in Dayton, Ohio, as the Red Storm will square off with Arizona State. The game will air on truTV. They are the second game of the night, with tip off around 9:00 p.m. The West Region was the one that was announced last during the Selection Show on CBS Sunday night, making it quite tense for a team on the bubble. They have advanced to the Sweet 16 nine times and made six appearances in the Elite Eight. The last of St. John’s two Final Four berths came in 1985, when the team was led by National Player of the Year Chris Mullin. 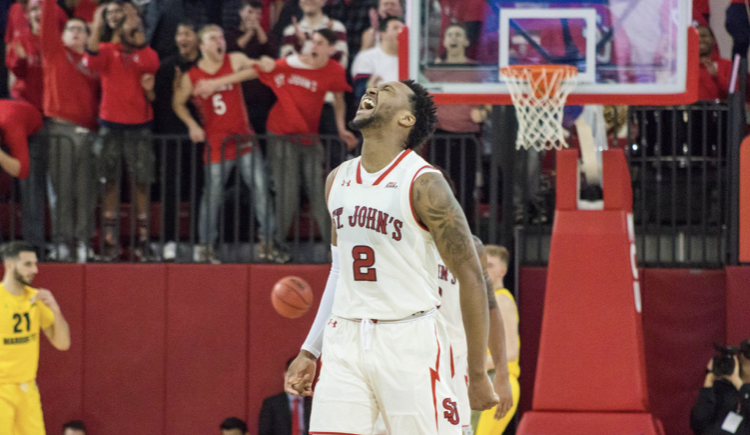 The Red Storm are led by two-time First Team All-BIG EAST selection Shamorie Ponds. He one of just five players in program history to earn multiple First Team All-Big East honors, ranks third in the Big East in scoring while placing second in assists (5.2 per game) and first in steals (2.6 per game). He also leads the conference in assist-to-turnover ratio at 2.6-to-1. St. John's is one of just two teams in the Big East to feature five players averaging double figures.